Evidence-based justice – or NOT! It’s hard to generate good evidence on which to base policy and programs. It’s even harder when that evidence exists, is publicly available and blatantly ignored. Sometimes when we talk about comparing a group receiving services to a group not receiving services, it is argued that it is unethical to deny anyone a service (this always comes up when planning social impact bonds and other pay for success programs). There is an underlying assumption in this argument that all services are beneficial to their recipients. 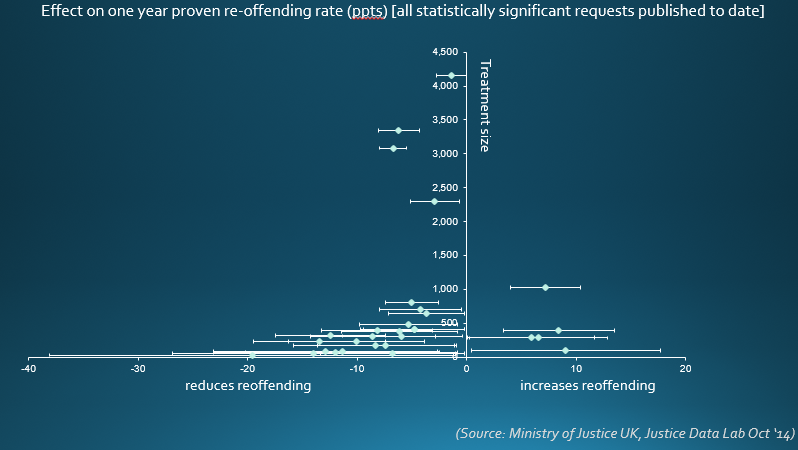 Results from the Justice Data Lab in the UK show that services are not always beneficial, as some programs that intended to reduce reoffending actually increased reoffending. The Justice Data Lab was launched on a trial basis in April 2013. For organisations delivering services to reduce reoffending, it provided the first opportunity to have an effect size calculated against a matched national comparison group, for no financial cost. A key condition of the Justice Data Lab was that the Ministry of Justice would publish all results. For more information on how the Lab works, see the brief summary I wrote last year. Critics of the Justice Data Lab point out that organisations are able to choose which names they submit, so are able to bias the results. Despite this, not all results have been positive. Up to October 2014, 93 programs have applied. Only 30 of these had statistically significant results. 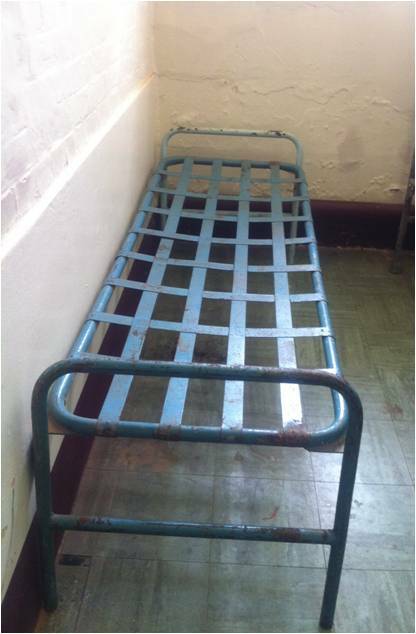 Of these, 25 were shown to reduce reoffending and five increased reoffending. The UK is currently undergoing a huge policy reform, Transforming Rehabilitation. What role the Justice Data Lab and its results will play in this process is unknown. Sometimes the hardest part of the evidence cycle is making decisions that reflect the evidence. 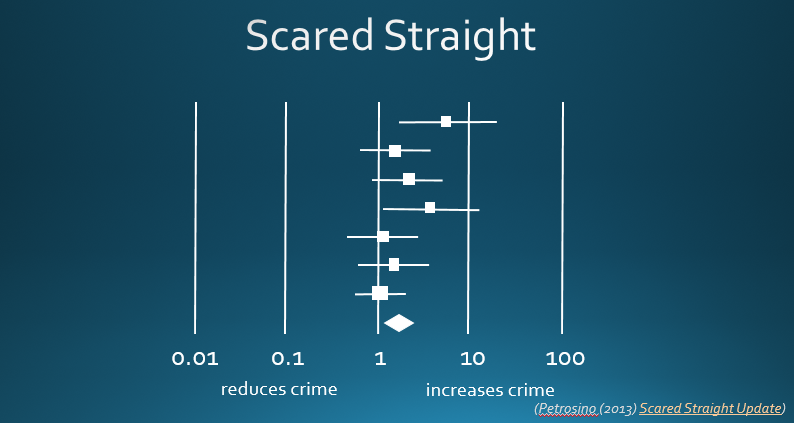 Perhaps the most notorious of programs that consistently increases reoffending is Scared Straight. Scared Straight involves taking young people into prisons, where they speak to incarcerated offenders and ‘experience’ being locked up. The idea is that they’re so shocked by what they see they will never offend themselves and risk a life behind bars. Unfortunately, for the young people participating in these programs, the incidence of prison increases. Scared Straight programs spread across the US after a documentary of the same name won an Academy Award in 1979. The effect of many of these programs was not evaluated, but there were two studies published only a few years later, in 1982 and 1983, showing that out of seven evaluations, not once did the program reduce reoffending, and that overall the program increased reoffending. These analyses have been repeated several times, but the results remain the same (Petrosino (2013) Scared Straight Update). Despite this evidence being publicly available and fairly well known, in January 2011, the Disney-owned TV channel A&E began to broadcast their new series Beyond Scared Straight. The program follows “at-risk teens” and is “aimed at deterring them from a life of crime”. Despite outcry, public condemnation and petitions, the channel refuses to cancel the series, which is about to enter its eighth season. The Washington State Institute for Public Policy estimates that each dollar spent on Scared Straight programs incurs costs of $166.88, making it the only juvenile justice program in their list with a negative cost:benefit ratio (see their summary below). For the young people enticed into the program, their prize is not only a terrifying experience, but a greater likelihood of a stint in one of the unhappiest places on Earth. The Cochrane Collaboration – systematic reviews of evaluations in health. The Campbell Collaboration – sister of Cochrane for other policy areas e.g. where the Scared Straight update is published. Test, Learn, Adapt: Developing Public Policy with Randomised Controlled Trials – from the UK Cabinet Office clearly sets out how public programs can use randomised controlled trials to develop evidence-based programs. Rather than ‘denying’ service, the authors encourage randomisation of rollout of a new program, for example, as a cost-neutral way of enabling better data collection and learning. Creating a ‘Data Lab’ – from NPC, about submitting the proposal that initiated the Justice Data Lab and continuing work to seed similar programs in other service areas. The June 2013 interim results released by the Ministry of Justice gave us a chance to examine the relationship between the number of criminals and the number of crimes they commit. The number of criminals is referred to as a binary measure, since offenders can be in only one of two categories: those who reoffend and those who don’t. 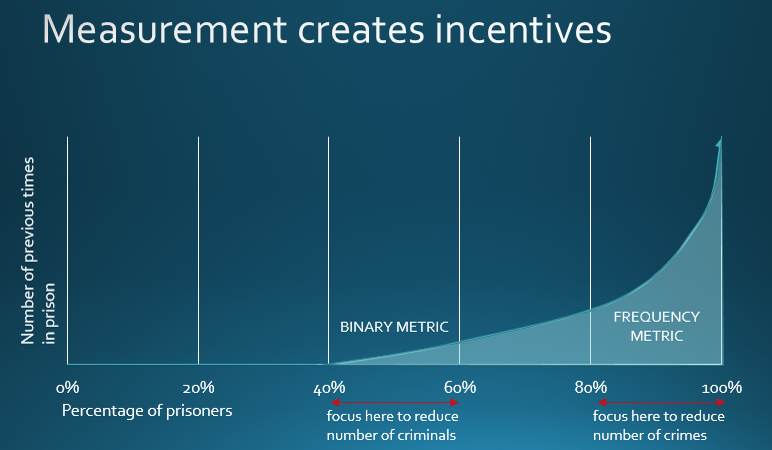 The number of crimes is referred to as a frequency measure, as it focuses on how many crimes a reoffender commits. 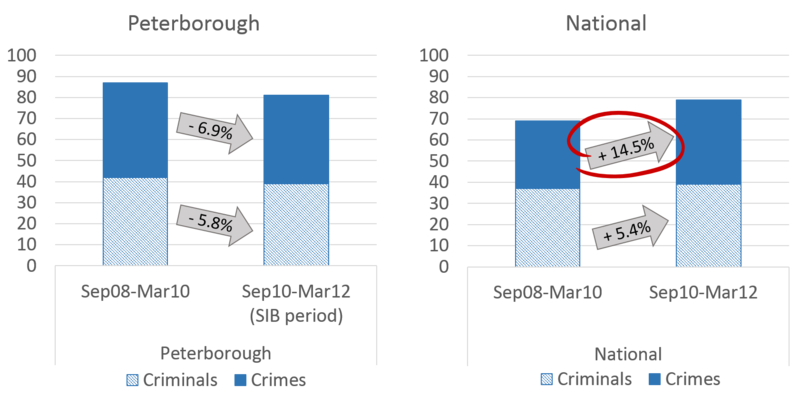 In the period the Peterborough SIB delivered services to the first cohort (9 Sept 2010-1July 2012), the proportion of crimes committed over the six months following each prisoner’s release reduced by 6.9% and the proportion of criminals by 5.8%. In the same period, there was a national increase in continuing criminals of 5.4%, but an even larger increase of 14.5% in the number of crimes they commit. The current burning issue is not that there are more reoffenders, it is that those who reoffend are reoffending more frequently. Criminals (binary measure) in this instance are defined as the “Proportion of offenders who commit one or more proven reoffences”. A proven reoffence means “proven by conviction at court or a caution either in those 12 months or in a further 6 months”, rather than simply being arrested or charged. I have heard politicians and policy makers argue that the public are more interested in reducing or ‘fixing’ criminals than helping them offend less, and thus the success of our programmes needs to be based on a binary measure. I don’t think it’s that hard to make a case for reducing crime. People can relate to a reduction in aggravated burglaries. Let’s get intentional with the measures we use. A bunch of very effective and well-evidenced programs from the US. I had the good fortune to attend a presentation by Mark Kleiman, given to the members of the NSW Government Better Evidence Network in late 2013. I was incredibly impressed. This was the best presentation on evidence-based criminal justice programs I’ve ever seen. As the Ministry of Justice in the UK consults on their new approach to probation, I think it’s timely to check out the parole approaches promoted by Kleiman. Basically, Kleiman argues that parole systems offering severe, delayed punishment are ineffective and the approaches that work are “swift-certain-not-severe”. Read his article A New Role for Parole – he says it so well I find it hard to add anything! I’ll throw in a quote and let you research the details of these programmes yourself. The best-publicized program built on this set of principles is the HOPE program in Honolulu, which requires random drug tests of probationers and, for those who fail, an immediate short stint (typically two days) in jail, with no exceptions. The SWIFT program in Texas, the WISP program in Seattle, the Swift and Sure program in Michigan, and Sobriety 24/7 in South Dakota all work the same way, and all have the same results: drastic reduction in illicit-drug use (or, in the case of 24/7, alcohol abuse), reoffending, revocation, and time behind bars. There’s nothing surprising about the fact that this approach works—it’s simply the application of well-known behavioral principles to a fairly straightforward problem. What is surprising is how well it works. In Hawaii, HOPE clients are mostly longtime criminally active drug users with a mean of seventeen prior arrests. A drug treatment program would be delighted if it could get 20 percent of such a population into recovery—and most would quickly drop out and go back to drug use. But in a carefully done randomized controlled trial with 500 subjects, eight out of ten assigned to the HOPE program finished the first year of the program in compliance and drug free for at least three months, with no rearrest. Most of them either never had a missed or dirty test (which would have led to a forty-eight-hour jail stay) or had only one such incident. That suggests that more than mere deterrence is at work; HOPE clients seem to be gaining the ability to control their own behavior.